UFC president Dana White is on the doorstep of hosting the biggest heavyweight scrap in company history, yet he can’t stop fielding questions regarding Strikeforce’s employee. 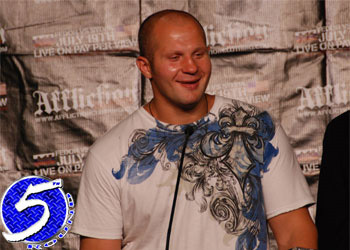 On Friday, White accused Fedor Emelianenko of being fugazy following his upset loss to Fabricio Werdum. Not only did the world’s best heavyweight 🙂 get submitted in :69 seconds, but it was to the limbs of Werdum, who became a UFC reject after the Brazilian’s price tag increased following a devastating LOSS to Junior dos Santos. That has really allowed Dana to enjoy dumping salt on the Russian’s wounds. Although Emelianenko has one fight remaining on his Strikeforce contract, White remained steadfast in his newly found disinterest in allowing the 31-2 heavyweight into his Octagon – despite admitting his “obsession” for signing Fedor just three months ago. Keep in mind, White said similar things when Wanderlei Silva hit the open market following his back-to-back knockout losses in Pride. He was merely posturing with that superstar and there’s no reason to believe he’s not doing the same thing to arguably the best pound-for-pound mixed martial artist on the planet. Anything White utters from here on out is to try and strengthen their bargaining power when Emelianenko becomes available. I just cant wait to hear what he spews if Fedor manages to dodge, duck, dip, dive and dodge his courtship once again.